Law Enforcements #1 choice is a vehicle mounted thermal imager with PTZ control. The M5® surpases previous generation law enforcement and military vehicle thermal systems that were always lacking. Common complaints included lack of a visual CCTV channel with zoom, limited pan range, fixed spotlight or grill mounted designs, large size and outrageous pricing that often put these necessary safety systems out of reach for most budgets. 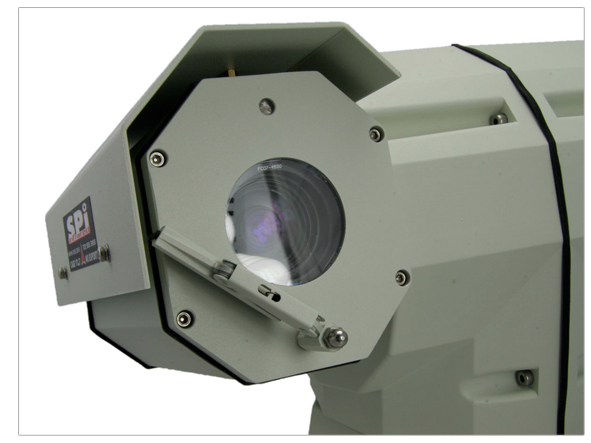 The M5® vehicle mounted thermal imager satisfies the needs of law enforcement, military and security personel. The new M5® mutli-sensor pan tilt system offers you full range of motion with its continuous 360 degree pan rotation. The system includes both a high resolution thermal camera and an ultra long range zoom CCTV visual camera which gives you uninterrupted 24/7 situational awareness. Being small and lightweight the M5® thermal infrared camera can be mounted on almost any vehicle. Installation has been greatly simplified consisting of a single main cable that carries video and control signals to and from the system. There is no cumbersome interface box to mount or complicated wiring to run through the vehicle. Simply attach the system to the vehicle, give it power and connect it to the joystick hand controller and your ready to roll. All of this comes at a cost that is about a third the cost of traditional multi sensor vehicle mounted PTZ camera systems. With the M5® Themal Imager you really do get more and pay less. The M5® PTZ vehicle mounted thermal imager breaks new ground in affordable high performance mobile pan tilt thermal imaging solutions. 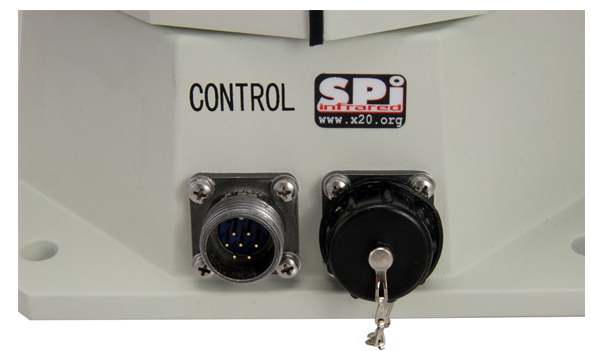 Ideally suited to a wide range of applications including; patrol vehicles, crash rescue truck, HMMWV standard and up armored M1151, border patrol, nuclear facility security, law enforcement and any application that calls for a combined thermal infrared camera visual CCTV sensor suite on a vehicle mounted pan tilt base. Lets take an in depth look at what the M5® vehicle PTZ has to offer. The M5® uses a simplified military style connector with a reduced pin set to maximize reliability. Older systems used massive connectors with very dense pin populations sometimes as many as 20-30 pins in a single connector. This translated to huge main system cables often in excess of 1" in diameter. The old technology made installing the main system cable very difficult due to its size and rigidity. Enormous holes had to be cut in firewalls and roof structures to accommodate the older system cables. This was often undesirable and could even compromise the integrity of specialized service vehicles. These gigantic densely packed cables were also very expensive and by packing so many wires into a tight design they were prone to failure. The M5® Vehicle System uses a single twist on type connector with only 8 pins. There is NO interface box or external electronics of any kind which greatly reduces installation time, failure points and most importantly cost. In Vehicle based applications this is of critical importance. Many specialty service vehicles are already packed with electronics so finding a place for another 1' square box to be mounted can be difficult if not impossible. The M5® was designed to easily integrate into even the most feature laden vehicles with the absolute minimum footprint. The lightweight and small size of the M5® system cable makes it easier to install in even the most cramped vehicles. You might think that an imager at this price point might sacrifice features in favor of low cost. This is not the case with the M5®. The PTZ is fully gasket sealed and has a removable sun shield to protect the system in almost any weather condition. The design of the M5 has taken a revolutionary approach to withstanding the demands of vehicle mounted PTZ systems. Traditional systems have been very large, heavy and stiff. Simplistic engineers have traditionaly built these systems to be like the mighty oak tree, strong and stiff. This simple minded approach yields bloated systems that can only withstand so much and then they snap! Detailed thought went into the dsesign of the M5®. Rather than taking the easy way out, the engineers of the M5® built the system to be like a bamboo tree rather than an unforgiving oak. Like the bamboo tree the secret of the M5®'s strength is a combination of many factors working together rather than the single note approach of ressistance. The M5® is made of strong but light weight materials for the simple reason that less mass means less force on the system. The M5® vehicle system is also made to flex and give when external forces are applied to its housing. This is accomplished with the use of a carefully engineered clutch system that allows the pan tilt base to "slip" in any direction rather than snap when too much force is applied from wind or external objects. Like bamboo that flattens out in heavy wind and then pops right back up to keep growing, the M5® is always ready for service. On top of the necessities like a weatherized housing and innovative construction, the M5® sports the hottest upgrades like an integrated remote wiper. 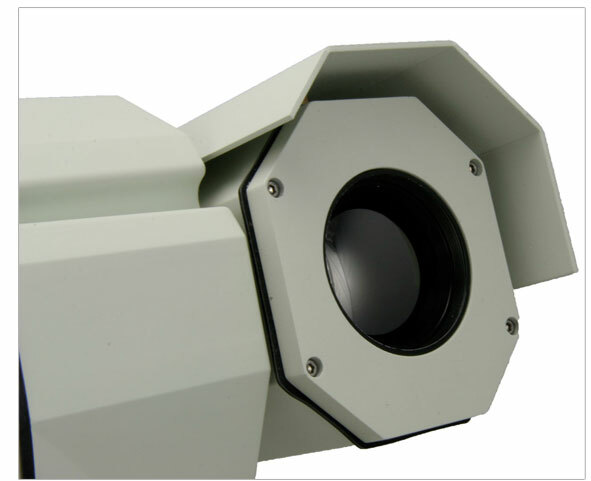 Most high end thermal camera PTZ systems consider the wiper an extra cost optional item. We have never bought a car with optional windshield wipers! The better cars even come with wipers for the headlights. The heart and soul of the M5® is its advanced thermal imaging system coupled with a crystal clear coated thermal optic train that produces a crisp thermal video of your surroundings 24/7 and in any lighting condition. The real advantage of the system lies in its ability to show you what cant be seen with the naked eye. Thermal imagers are a true passive technology that images the infrared energy that is emitted from every object in the universe. This is very different from cheap infrared light cameras (aka "parking lot cameras") that shine an invisible light a few feet away and then image the light that bounces back. The M5® senses the long wavelength infrared energy that is always emitted from everything around you. A finely tuned optical train focuses this energy onto the M5® thermal sensor chip which provides you with a thermal video image of your surroundings. This is true "see in the dark technology" with NO LIGHT shinning out of the system to give away the position of the cameras. The M5® thermal chip doesnt even "see" light so it cant be fooled or blinded by light sources such as daylight or oncoming car headlights. In a vehicle scenario the M5 not only gives you true 360 degree situational awareness but can also be an aid in driving seeing farther down the road than either your headlights or IR cameras can. 24 hours a day 7 days a week, the M5® vehicle multi-sensor thermal technology will see everything.